I thought I knew what this book was going to be about when I started it, but by the time I came to the end I was no longer sure. There is a prologue that begins with Charles Dickens’s observations and depictions of miserable London poverty, and then moves naturally to the classical Malthusian trap as the only explanation offered by the political economy of the time: any improvement in the general standard of living will be wiped out by increased population, so nothing much can be done except perhaps exhortations of abstinence. Dickens himself entered a plea for a more humane political economy. (This was an interesting piece of news to me. Presumably he intended something more than sugarcoating the pill, but what?) That could indeed be a “Grand Pursuit”: how economics and the economy learned to adapt to sustained growth and rising living standards. Sylvia Nasar’s first chapter almost confirms this idea; it is about Marx and Engels, with more emphasis than is usually given to Engels and his powerful Condition of the Working Class in England in 1844. But this suggested theme does not hold up. The book is not “The Story of Economic Genius” that is promised in the subtitle. 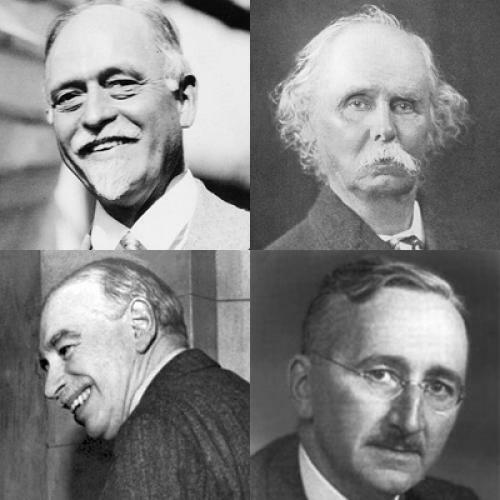 It is instead the story of the public and private lives of a handful of major figures in economics, some of them pretty clearly possessed of “economic genius,” at least part of the time, and some of them pretty clearly not, unless one plays fast and loose with the notion of genius. Most surprisingly, there is not much about the evolution of economic ideas in this book, either in the way Dickens hoped or otherwise. There is a lot of quite fascinating biographical detail about a series of interesting economists, and even more about the political, financial, and economic setting in which they functioned. Nasar spends much more time on the public role of her subjects than on their thoughts about economics itself. They were indeed all public figures of one kind or another. Many of them were also important economists, but you do not hear much about that at all; and when you do, the book skimps on intellectual content. One does not have to wait for an example of this gap. A chapter on Alfred Marshall follows immediately after Engels and Marx. Marshall was one of the founders of modern economics. His Principles of Economics, which appeared in 1890 and went through a total of eight revised editions, was the great general treatise after John Stuart Mill. When I first studied economics in 1940, we were not given Marshall to read as a textbook; it would probably have been an improvement if we had. It is not much remembered today that Marshall was not merely the man who systematized the theory of the firm and the interaction of supply and demand in a competitive market. He was also an assiduous observer of the industrial practices of his time, and the ways in which they often deviated from the neat but necessary abstractions of theory, including his own. He was interested, for example, in the role that perceptions of fairness played in the determination of wages. He knew that rising productivity was the serious answer to mass poverty. You might say that he was starting to give Dickens his wish. So it is surprising to read a forty-three-page chapter about Alfred Marshall that arrives at the Principles of Economics only in its last few pages. By contrast, Agnar Sandmo, the author of Economics Evolving: A History of Economic Thought, an excellent recent history, offers an economist’s-eye view: he devotes a twenty-five-page chapter to Marshall, almost all of which is essentially about the content and the influence of Marshall’s great work. THIS PATTERN of downplaying intellectual content persists throughout. The rest of Nasar’s cast of characters includes Beatrice Webb (an oddball in this company), Irving Fisher, Joseph Schumpeter, John Maynard Keynes, Friedrich Hayek, Joan Robinson, Milton Friedman, Paul Samuelson, and Amartya Sen. In no case is there a serious discussion of the ideas that might earn their author a place in a history of economic thought, although some on the list are truly important figures in that story. It may be that this approach does best, almost accidentally, by Schumpeter. So far as economics, as understood by economists, is concerned, Schumpeter contributed one important and fertile idea, and he had formulated it by 1912. It was the insight that the dynamics of a capitalist economy are driven by technological and organizational innovation, and the key figure in this process is the entrepreneur who mediates between sheer invention and the market economy. He also emphasized the importance of credit creation as the mechanism that places resources in the hands of active entrepreneurs. SCHUMPETER thought of Keynes as his natural rival for the title of “greatest economist.” They were born in the same year, 1883. Keynes probably did not believe that he had a natural rival. Nasar’s approach is less successful with Keynes than with Schumpeter, because the proportions are wrong. Keynes, too, had a gossip-worthy private life and an important public role, beginning with the Paris Peace Conference; as a subordinate member of the British delegation, he saw the dangers in the Treaty of Versailles and wrote a devastating book about them called The Economic Consequences of the Peace. That public career extended to the Bretton Woods Conference one world war later, where Keynes was one of the architects of the International Monetary Fund, the World Bank, and therefore the postwar international financial system. This part of Keynes’s story is certainly well told in the book. But Keynes was also the creator of serious macroeconomics in 1936, in The General Theory of Employment, Interest, and Money. He was not without antecedents, of course, but he provided the first workable intellectual apparatus for thinking about what determines the level of “output as a whole.” A generation of economists found his ideas the only available handle with which to grasp the events of the Great Depression of the time. The analytical issues here are inevitably more complicated and abstract than something like creative destruction. Nasar gives them a scant two pages, which seem to me to be inadequate; a reader who does not already understand will not absorb the significance of Keynes’s break with then-standard doctrine. By shying away from a fuller exposition, Nasar keeps her narrative moving, but misses an important opportunity. These issues are still alive or, perhaps more accurately, they are alive again. One reason why Keynes’s great book is so difficult to explain is that it is no masterpiece of clarity. There are still learned arguments about “what Keynes really meant.” I want to emphasize two of its themes, because they seem to be central to his place in the story of economic genius, and because they point directly to the reason why Keynesian economics, born in the 1930s, has become dramatically relevant again today. Back then, serious thinking about the general state of the economy was dominated by the notion that prices moved, market by market, to make supply equal to demand. Every act of production, anywhere, generates income and potential demand somewhere, and the price system would sort it all out so that supply and demand for every good would balance. Make no mistake: this is a very deep and valuable idea. Many excellent minds have worked to refine it. Much of the time it gives a good account of economic life. But Keynes saw that there would be occasions, in a complicated industrial capitalist economy, when this account of how things work would break down. The breakdown might come merely because prices in some important markets are too inflexible to do their job adequately; that thought had already occurred to others. It seemed a little implausible that the Great Depression of the 1930s should be explicable along those lines. Or the reason might be more fundamental, and apparently less fixable. To take the most important example: we all know that families (and other institutions) set aside part of their incomes as saving. They do not buy any currently produced goods or services with that part. Something, then, has to replace that missing demand. There is in fact a natural counterpart: saving today presumably implies some intention to spend in the future, so the “missing” demand should come from real capital investment, the building of new productive capacity to satisfy that future spending. But Keynes pointed out that there is no market or other mechanism to express when that future spending will come or what form it will take. Perhaps God has not yet even decided. The prospect of uncertain demand at some unknown time may not be an adequately powerful incentive for businesses to make risky investments today. It is asking too much of the skittery capital market. Keynes was quite aware that occasionally a wave of unbridled optimism might actually be too powerful an incentive, but anyone in 1936 would take the opposite case to be more likely. So a modern economy can find itself in a situation in which it is held back from full employment and prosperity not by its limited capacity to produce, but by a lack of willing buyers for what it could in fact produce. The result is unemployment and idle factories. Falling prices may not help, because falling prices mean falling incomes and still weaker demand, which is not an atmosphere likely to revive private investment. There are some forces tending to push the economy back to full utilization, but they may sometimes be too weak to do the job in a tolerable interval of time. But if the shortfall of aggregate private demand persists, the government can replace it through direct public spending, or can try to stimulate additional private spending through tax reduction or lower interest rates. (The recipe can be reversed if private demand is excessive, as in wartime.) This was Keynes’s case for conscious corrective fiscal and monetary policy. Its relevance for today should be obvious. It is a vulgar error to characterize Keynes as an advocate of “big government” and a chronic budget deficit. His goal was to stabilize the private economy at a generally prosperous level of activity. A second characteristically Keynesian theme meshes very well with the first. In a complex economy, many business decisions have to be made in a fog of uncertainty. This is especially true of investment decisions, as already discussed: a lot of money has to be placed at risk today in an enterprise whose future success can only be guessed. (Much the same can be said of consumer purchases of expensive durable goods.) The standard practice is to focus on the uncertainty and think about it in terms of probabilities, which at least allow for an orderly analysis and orderly decision-making. Keynes preferred to focus on the fog. He thought that some of the important uncertainties were essentially incalculable. They would end up being dealt with in practice by a mixture of apprehensiveness, rules of thumb, herd behavior, and what he called “animal spirits.” The point of this distinction is not merely philosophical: it suggests that long-term investment behavior will sometimes be irregular, unstable, and given to doldrums and stampedes. Expectations can be volatile, and transmit their volatility widely. Passive or perverse policy can be dangerous to the economy’s health. There is much more to be said, of course, about the “Keynesian revolution,” including its gaps and its limitations. It has been debated by economists ever since 1936. Sandmo’s history of economic thought gives it a whole twenty-eight-page chapter. But even his very brief sketch will supplement Nasar’s vivid account of Keynes’s activity in the great world. IRVING FISHER was America’s first great economist, and also a bit of a crank about alcohol, healthy food, eugenics, and more. (He invented the Rolodex.) Fisher, who was born in 1867 and died in 1947, was conspicuously over-optimistic at the wrong time about the economy and the stock market, and lost a fortune (partly his wife’s) in the collapse of the 1930s, accompanied by those who followed the confident investment advice in his newspaper columns. Nasar makes the most of this quirky character, and uses the conjunction of quirkiness and intellectual prowess as a nice counterpoint to the stereotypical views of Beatrice Webb and other educated English visitors who saw Americans as a bunch of hayseeds and traveling salesmen. Once again, this makes for lively reading with some history thrown in; but the reader will not grasp what Fisher contributed to the grand pursuit of economic understanding, what makes him worth including in the story of economic genius. Actually he contributed more than one valuable idea. The most important and indispensable, however, was a systematic way to think about the rate of interest, saving, and investment—in other words, about the main economic connection between present and future. What he wrote on this central question in 1907 and again in 1930 is still, though much elaborated, the foundation for modern thinking. I hope I can communicate the rough idea. For a saver, the current rate of interest describes the terms on which current consumption can be exchanged for future consumption: a little less consumption (more saving) now can be lent on the market, and principal and interest can be spent on consumption next year or later. The higher the interest rate, the more future consumption a dollar of current saving will buy. It is generally supposed that a unit of future consumption is worth somewhat less to a consumer than the same unit of current consumption right now; but the earning of interest can make saving worthwhile. The main potential borrowers are business firms that are contemplating adding to their capacity by real investment. To them, the interest rate is a cost (“the cost of capital”), and they will make a particular investment only if they think it will earn enough to cover interest costs at least, plus some compensation for risk. The capital market is the arena in which a rate of interest is determined at which aggregate borrowing and lending are matched, with each potential borrower and lender, investor and saver, adapting as best they can to whatever interest rate is available in the market. The “equilibrium” interest rate is determined by this balancing of supply and demand. This summary is so crude as to be an insult to Fisher’s exposition in two fat books. He was, by the way, quite aware of the potholes that could disturb the smooth operation of the capital market, such as the influence of family affection, superstition, imperfect foresight, fashion, and so on. Keynes’s radical uncertainty would not have seemed far-fetched, and indeed Keynes made important use of Fisher’s ideas in his own discussion of business investment. So capital markets could be capricious and unstable. Generations of economists have worked to add realism and detail to this underlying apparatus, not always with perfect success, as you may have noticed. But it remains the foundation of any discussion of finance. FRIEDRICH HAYEK is a slightly awkward case for Nasar to handle. He was clearly an eminent economist. He had no official public life, and presumably would not have wanted one. But he was, and still is, a conservative, even a libertarian, icon; and he was at least a nominal influence on Margaret Thatcher. When the Royal Swedish Academy of Sciences divided a Nobel Prize between Hayek and Gunnar Myrdal, they knew it would make both men unhappy. To understand Hayek’s place in economics, one has to go back to the period immediately after World War I. Soviet communism ruled in Russia and an entirely different sort of socialist government was in power in Hayek’s native Austria. Hayek’s mentor, the even more far-right economist Ludwig von Mises, undertook to argue that efficient centralized economic planning was an impossibility in an advanced economy. The main reason was that no central planning bureau could conceivably have all the knowledge needed to allocate resources to alternative uses effectively. That knowledge—technological possibilities, local conditions, consumer preferences, likely futures for all these—is necessarily scattered around the economy. A system of (competitive) markets is a uniquely suitable way for this knowledge to be expressed and converted into decentralized decisions about production and consumption. No central organization could conceivably access and analyze this information and calculate the appropriate allocations. Hayek’s appeal to the political right comes not from these fairly tame, if interesting, ideas. It rests on The Road to Serfdom, a bestseller in 1944. There Hayek argued that even well-intentioned attempts to regulate industry are not only bad in themselves, but the start of a slippery slope that leads inexorably to “serfdom.” I remember thinking that, if Hayek were right, I should live to see Norway and the Netherlands at least halfway to tyranny. It seemed implausible then and it seems embarrassing today. Here I have to digress briefly, partly because the issue is interesting and partly to correct a casual error in Nasar. The Mises-Hayek critique of central planning was convincing (and clearly confirmed by subsequent facts). One response was a literature exploring the theory of “market socialism.” Could a public-ownership economy organize itself to use the remarkable properties of competitive markets and the informationcarrying capacity of market prices, while requiring only feasible interventions by a government agency? Indeed, if the government agency did its job properly, could such a system avoid some of the price distortions associated with everyday big-business capitalism? This impulse produced interesting ideas, as useful for understanding the workings of capitalism as for designing a hypothetical market socialism. In the end, the general verdict was that the real source of failure of market socialism would be its inability to motivate and to exploit the technological and organizational innovations that provide the engine of growth in a private-enterprise economy. In the course of the book, Nasar refers to Oskar Lange as “a Polish economist and central planner who collaborated with the KGB,” and later as a cold war spy. Lange immigrated to the United States via London, and taught economics very successfully at the University of Chicago. He wrote several quite interesting and well-known mainstream papers (and some less interesting ones) on a variety of topics, mostly technical. At the end of the war, and against the advice of his friends, he returned to Poland and held posts in the then-communist government. I had never heard any allegations of spying or earlier association with the KGB, and Nasar provides no evidence or reference. However that may be, it is certainly wrong to describe Lange as a central planner. He was, on the contrary, one of the leading theorists of decentralized market socialism, from as early as 1936. The sorts of prices that were presumed to be used to guide such an economy are colloquially known as “Lange-Lerner prices” after him and Abba Lerner. SO WHAT WAS the “Grand Pursuit”? In a brief epilogue, Nasar suggests two possibilities. One is the actual real-time historical process by which the advanced countries have freed themselves from the Malthusian trap, and created an economy in which a rising standard of living is not only achieved but expected. The other is the story of how economists have learned to understand the mechanisms and relationships that make the historical process possible. There is an interesting connection between these two trails. Nasar sniffs at it, but does not follow it. We think of the Industrial Revolution as having started in the last quarter of the eighteenth century with a famous series of mechanical inventions. No doubt some people profited, but the general standard of living did not start to rise immediately. Decades went by before anything like that could be detected. Still, it is puzzling that so intelligent a person as John Stuart Mill, writing in the middle of the nineteenth century, continued to take it for granted that the stationary state with subsistence or near-subsistence wages was the inevitable end of the process. Mill knew of the inventions that had transformed the textile and metalworking industries of Great Britain. He even began to think about invention and innovation not as serendipitous events, but as economic processes. But he did not make the intellectual leap that Nasar attributes to Marshall a few decades later. Why not? One can guess at several reasons for this failure of imagination. First of all, Mill’s thinking was still in the clutches of the Malthusian trap. The real-world change in family behavior that we now call the “demographic revolution” had not yet happened (as it has still not happened in some parts of Asia and Africa). When couples began to control family size, a major obstacle to real economic growth weakened or disappeared. Secondly, the notion of a continuing, more or less self-generating process of invention and innovation, as against just a run of episodes, was not yet part of the mental furniture of economics. And thirdly, even if Mill or some of his contemporaries had been able to conceptualize economic progress in this way, they lacked the analytical technique that might have enabled them to work out a coherent picture of a progressive economy evolving in time. Weaving it all together, which is now second nature to graduate students, was not then a practical possibility. So the intellectual side of the Grand Pursuit had to wait for a bit. This could have been an interesting story to trace in more detail, through a larger cast of characters, coming to terms, step by humdrum step, with the new reality, and folding it into the body of economic theory. On the other hand, that might make rather dull reading. In any case, Nasar took a different tack, as I have already described it. She offers a colorful, sometimes even exciting, series of historical vignettes involving important protagonists in the history of economic thought. They appear sometimes as meritorious, occasionally as foolish, usually as self-confident, in the manner of important protagonists. You know that they have contributed to the body of economic thought, although you may not always know exactly what they have contributed. At least your sense of them is not less than life-size. Are these stories really part of the Grand Pursuit? In a way, I guess, they are. These performances on the public stage are one vehicle, maybe the most important vehicle, which carries the results of economic research to broader attention. Without them, serious economic ideas might never have the opportunity to influence policies and events. Of course, even with them the results can be dubious: in the current controversy over statutory limits to U.S. Treasury borrowing, the influence of serious economics has been zero, or perhaps less. Still, this may be the logic of Nasar’s approach. A reader whose interest is kindled by the personalities and the narratives might like to turn to the history of economic thought by Agnar Sandmo that I cited earlier, to learn more about the evolution of ideas, and their content. You may remember that when Miss Prism, the governess in The Importance of Being Earnest, reminds Gwendolyn to read her political economy, she instructs the pupil to skip the chapter on the Indian rupee, because it is too sensational for a young girl. If only. Robert M. Solow is Institute Professor of Economics emeritus at MIT. He won the Nobel Prize in Economics in 1987. This article appeared in the October 20, 2011 issue of the magazine.